The Chesapeake Bay and its tributaries define the shape of the Virginia coast. Virginia’s shoreline is characterized by a series of peninsulas, formed by the tidal waters of the Chesapeake. Virginia’s Eastern Shore is a narrow peninsula that’s not connected to the rest of the state by land. The Eastern Shore is accessed via the Chesapeake Bay Bridge Tunnel or from the north, through Maryland. On the mainland side of the state, the Hampton Roads cities of Virginia Beach, Norfolk, Portsmouth, and Hampton all have land on the shores of the Chesapeake or one of its supplying tributary rivers. Virginia’s western shore is segmented into a series of peninsulas or “necks” that are formed by the James, York, Rappahannock, and Potomac Rivers. Follow the links below for more information on Virginia destinations within the Chesapeake Bay area. Cape Charles: This small Eastern Shore town sits right on the Chesapeake Bay. Cape Charles has it’s own beach, lots of grand old homes, marinas for transient boaters, and two championship golf courses. Hampton: A waterfront city steeped in history. Lots of interesting neighborhoods to explore. The home of Fort Monroe and the Virginia Air and Space Center. Irvington: Small town on Virginia’s Northern Neck. Home of the well-known Tides Inn and Resort. Golf courses, the Steamboat Era Museum, and Historic Christ Church. Mathews County: Middle Peninsula rural charm and a relaxed lifestyle. Norfolk: This city is the home of the the US Navy’s Atlantic Fleet. You’ll see the Navy ships just up the Elizabeth River from Norfolk’s waterfront downtown. Onancock: All the charm of an old-fashioned small town, with plenty of amenities for visitors. Restaurants, shops, galleries, theaters, bed & breakfasts, and a marina. Poquoson: Home of the annual Seafood Festival. Portsmouth: Across the river from Norfolk. Historic district, museums, and an outdoor concert venue. Reedville: Northern Neck town with a long history in fishing. Home of the Reedville Fishermen’s Museum. Tangier Island: A unique island community out in the middle of the Chesapeake Bay. There are no roads to get there, but you catch a ferry from Reedville, Onancock, or Crisfield. Urbanna: Home of the very popular Urbanna Oyster Festival. 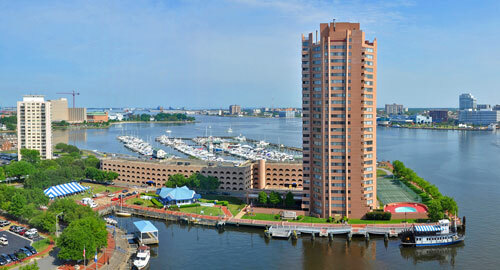 Virginia Beach: Virginia’s coastal resort community with miles of shoreline on the Atlantic Ocean and Chesapeake Bay.